Ah, Thanksgiving. My favorite holiday. What’s not to love about a holiday entirely devoted to a big, cozy meal with family and friends? Well, it gets weird when you’re the awkward vegan sitting in front of a prized dead bird. The key, I’ve learned, is to bring plenty of delectable items that just so happen to be vegan. You have to woo the crowd and elicit reactions of shock and awe. Last year, I won over the carnivores with a platter of roasted vegetables, booze balls, and chocolate-pumpkin bread pudding. 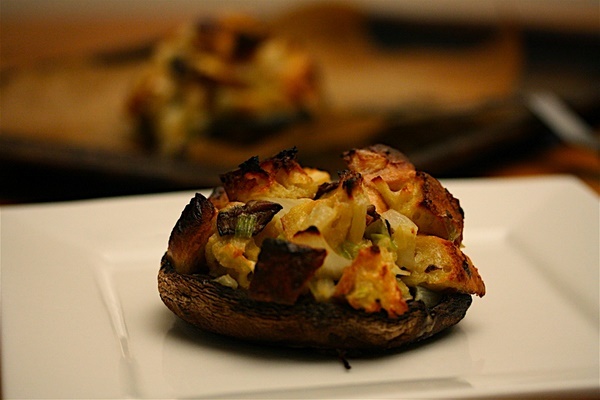 They were also treated to a hearty side dish: harvest-stuffed portobello mushrooms. When served warm with a freshly-roasted slice of tomato these mushrooms are filling and deeply satisfying. Turkey becomes less of a centerpiece and more of an accessory once you begin to appreciate the true abundance of flavors of this vegetarian side. This dish is loaded with fiber and protein and can definitely stand on its own on a Thanksgiving table. Enjoy! Suzannah Schneider is a junior at Tulane University majoring in Saving The World (Environmental Studies and International Development). When she’s not hugging trees or cooing at farm animals, she’s cooking up gourmet vegan fare. In a large skillet, sauté the cashews and onions with 2 tablespoons of olive oil over medium heat. Add salt and pepper to taste, and continue to sauté until the onions are soft and slightly brown. Add the garlic and cook a few more minutes, stirring frequently. In a large bowl combine the onion mixture, brown rice (or grain of choice), breadcrumbs, vegetable broth, basil, and thyme. Mix and season to taste with salt and pepper. Lightly brush olive oil on both sides of the mushroom caps and place top-side down on an oiled baking sheet. 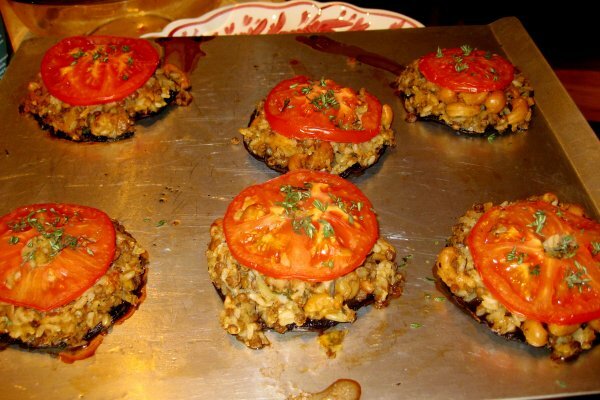 Stuff mushrooms with about 1/2 cup lentil cashew stuffing, then press a tomato slice on top of the stuffing.